EMTs are individuals who are trained to provide varying degrees of pre-hospital patient care to individuals who have been hurt or injured. The exact duties you carry out will depend on your EMT level and the scope of practice allowed in your particular state or region. You will respond to emergency situations where an individual has become hurt or injured. EMTs are called to various emergencies including but not limited to: fires, auto accidents, industrial disasters and workplace injuries. You will also respond to calls about people who are severely hurt or ill at home, work or a range of other locations. EMTs will need to help when there are natural disasters where people are or could become injured. Examples include: earthquakes, tornadoes, hurricanes, flooding and so forth. You will need to be prepared to respond to large scale emergencies such as crime scenes from shootings, explosions and many other situations. States often have three levels of EMT: The EMT-Basic, EMT-Intermediate and Paramedic. Some states might use different titles for each level or may have additional levels or specialties for which an individual can train. As an EMT, there are certain qualities you will need to have. You must be prepared to put yourself in harms way. As mentioned above, there are times when you will be called ot treat the injured during dangerous situations. You must be an individual who can handle pressure well and who is not afraid to work under very stressful conditions. You should be someone who can take charge of a situation even where there is alot of chaos or when there are people around you who are not handling the stress well. As an EMT, be prepared to interact with people who are scared, hurt and sick and with their loved ones who are just as frightened. An EMT may need to put in long hours since you may be assigned long shifts. During those shifts there may be little time to rest depending on the number of calls to which you must respond. Sometimes you will go for extended periods without sleep and will miss mealtimes or even a chance to just sit and take a breather. If you have a desire to help people in some of their worst moments, this might be a job consideration for you. You can literally change lives and even save lives as an EMT. If you are looking to become an EMT, you cannot be less than 18 years old. It will be necessary to have a high school diploma or to have your G.E.D. You must be in good overall health and have the level of fitness needed for EMTs. As an example, you will need to be able to lift at least 100 pounds and to be able to carry your equipment with you-sometimes across difficult terrain. You will need to submit to a criminal background check as well. It will be necessary to have a current driver’s license in your state. Before you can begin training as an EMT, you will need to be CPR certified. CPR is an important part of your life as an EMT as you may be called upon to use it many times throughout your career. The path to becoming an EMT can vary a bit from state to state. That being said, no matter where you live, you will need to become licensed to work as an EMT which will involve formal training in an accredited training program for that state. Most EMT training programs will take 6 months to 2 years to complete depending on the location and the EMT level of training you are completing. Most states have three levels of EMTs which each level having increasingly more responsibilities. The three levels include: EMT-Basic, EMT-Intermediate and EMT-Paramedic. All prospective Emergency Medical Technicians must complete the basic level of training before moving into a more advanced EMT stage. 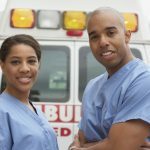 If you want to work as an EMT, you will need to complete EMT Basic Training. You can expect classroom instruction and lab tasks. Of course, you will also need to complete some training helping to care for patients directly. You will learn some basic anatomy and how to perform patient assessments. The course will teach you how to attempt to resuscitate individuals in a cardiac or respiratory crisis. Your training should teach you about major disasters such as natural disasters or situations where large numbers of people have been injured. IN EMT basic training you will learn how to safely lift and move patients. The training will prepare you for management of a patient in trauma situations until arriving at the hospital. You will learn how to handle blood loss in patients, how help protect a person’s airway, head and neck. You will even learn how to help with childbirth in emergency situations. Basic EMTs can further their training in an Intermediate Course. Depending on your state, the program could include 30-350 hours of training. You will again have both classroom instruction as well as field training. You will learn even more methods of helping to provide life saving care in emergency situations. EMT-Intermediate training will teach students how to administer various medicines and how to insert and give medicine via IVs. The training will provide more advanced and in depth knowledge of how to handle trauma situations. Both types of EMTs will also learn techniques for help individuals who have fallen victim to drownings or been injured in a fire. The exact skills you will learn will depend upon your state as well as the individual training program you have entered. The highest level of EMT training is for those wishing to become Paramedics. These programs may take as much as 2 years to complete. At some schools, you will actually be receiving an Associate’s Degree. You will have some general education courses in addition to the courses and hands on training directly related to work as a Paramedic. Some of the courses you will take will likely include biology as well as anatomy and physiology. You will learn about more advanced life support skills. Most EMTs are trained to intubate or to perform advanced airway management procedures. Most are also taught to start IVs and are granted permission to administer certain medicines via those IV’s. Paramedics are trained in pediatric and advanced life support. Training information: The hours of training you will complete will depend on the program you are taking. Keep in mind that in addition to the clinical instruction, you might also be required to complete an internship in the field so that you have an even greater understanding of your role in emergency medical services. You must pass all of your classroom, lab and clinical instruction before you can be eligible to sit for any licensing exams. It is necessary to have good attendance. You may not be allowed to miss any of your days of hands on instruction in a clinical or field setting. If you are ever struggling with any of the information you learn or performing any of the procedures, talk to your instructors right away. They really do want to help you to be successful. In some state there are more advanced EMT or even paramedic training levels. In each level you will learn increasingly more about helping individuals in emergency medical situations. The more training you have, the more duties you can take on within the legal scope of practice with your sector. Some states require more advanced cardiac training for EMTs or Paramedics who will be able to perform more cardiac related testing and treatment in the field. They may require more advanced training for other speciality life support services as well. There are many places to look for an EMT training program. Some program are offered through fire companies. Others are offered by ambulance companies and even hospitals with their own ambulance services. Community colleges and even some universities will have options to train as an EMT. Vocational centers for adults might also have EMT training options. Make certain any programs are fully certified so that you can sit for your certification exam after finishing all of your training. Whether you are going to work as an EMT or a Paramedic, you will need to sit for the licensing/certification exam in your state. The exam can be challenging but if you are well prepared, you should be successful. These tests will have written portions. But there will also be sections where you must demonstrate your ability to carry out various emergency medicine tasks and procedures. You can be required to take continuing education credits throughout your career as an EMT. Again the specifics will depend on your region of practice. Sometimes there will be very specific required training you must complete. This is especially true when there are changes in procedures or new advancements in medical technology.